We work with all insurance companies and all makes and models of vehicles to handle insurance claims. Kappy's prides itself on delivering top quality restoration work and collision repair services. The technician who starts the restoration will finish the job, ensuring quality and consistency. Our team specializes in paintless dent removal. Small to medium dents are removed without compromising the vehicle's paint. Family owned and operated since 1989, Kappy's Collision Center is a certified auto collision center serving Owatonna, Mankato & Rochester, MN. We specialize in total auto body repair, accident collision repair and paintless dent removal. Kappy's team of ASE Certified Technicians delivers quality work using the best parts and unbeatable customer service. You can trust that our technicians will get it done-and done right-the first time. We repair your car to the state it was in before your accident and ensure it meets manufacturers' standards. Car owners need to have an auto body shop they can trust when it comes to repairing your vehicle. At Kappy's, no job is too small or too large - from hail damage to total body repair in the Owatonna, Mankato, Rochester & Waseca, MN area. Whether you need a small dent removed or a full-scale repair, Kappy's is the auto repair shop for you. We use the highest quality parts and paint to ensure your satisfaction. Auto restoration and collision repair can be a pain. 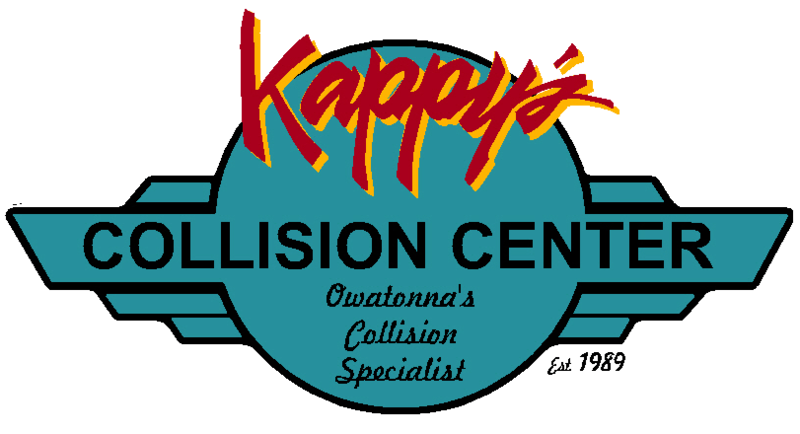 Let Kappy's Collision Center located in Owatonna, MN, take the pain away while taking care of all your auto body repair needs in the Mankato, Rochester, & Waseca, MN area. Just wanted to give a shout out to Kappy's Collision Center. They just did a hell of a job on my smashed up 2014 Ford Focus! The car looks brand new again! This is the 3rd repair they've done for me. There's a reason I keep coming back. I highly recommend them!! Copyright © 2019 Kappy's Auto Restoration, all rights reserved.